Offering a high level of luxurious accommodation, the villa is located in a quiet and beautiful setting, unspoilt by tourism, within easy walking distance of local beaches, restaurants, shops and historic sites. 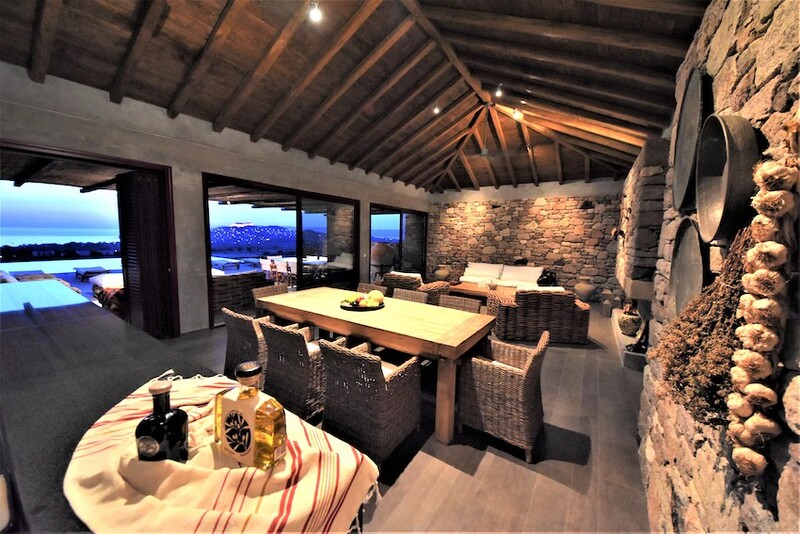 With a mountainous backdrop, the villa has stunning views of Molyvos, its Byzantine castle, the bay of Molyvos, the Aegean and the Ottoman coastline. 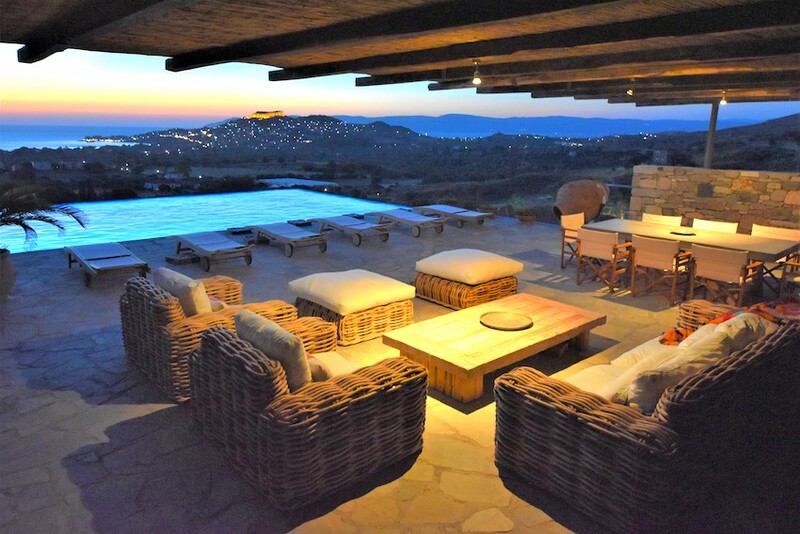 The contemporary design of the Villa rivals those on Santorini and Mykonos and offers a level of sophistication, rare to Lesvos. The design is open plan with sliding glass panel doors to create a seamless transition between the indoor and the central courtyard. An abutting building wing houses all bedrooms . All accommodation is on one level to provide unencumbered circulation. Western standards for sizes and space are adopted. Views are maximised from the indoor to the outdoor and the architecture itself successfully blends traditional building materials of natural stone and aged chestnut timber to present a contemporary simple yet refined aesthetic. The Villa was designed for families and groups of friends wishing to enjoy each other’s company at a relaxing, tranquil and peaceful environment, close to all the attractions that the village offers. There are three bedrooms, four bathrooms and sleeps six. 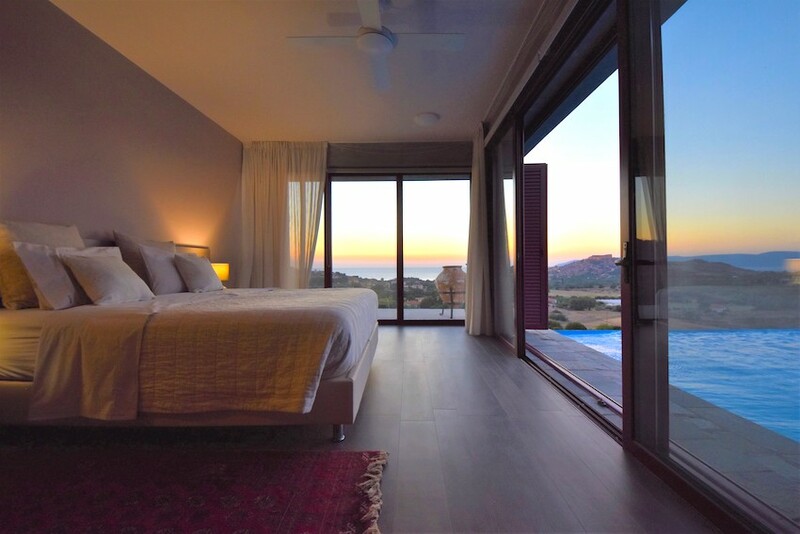 All bedrooms have views, large floor to ceiling windows with curtains and block out shutters. These spaces are calming and peaceful , offering king sized beds, premium bed linen, writing desk, with his & her separate built in robes. Each bedroom has it’s own luxuriously appointed ensuite with a marble and timber aesthetic to all walls and floors. Two additional fold out beds are available upon request . Catering to the Mediterranean climate, the central courtyard is an ideal place to entertain or just relax on those warm Greek summer days and nights. A large (11 x 7 meters) infinity, salt water pool, positioned to capture the panoramic vista, is the epicentre of the space. 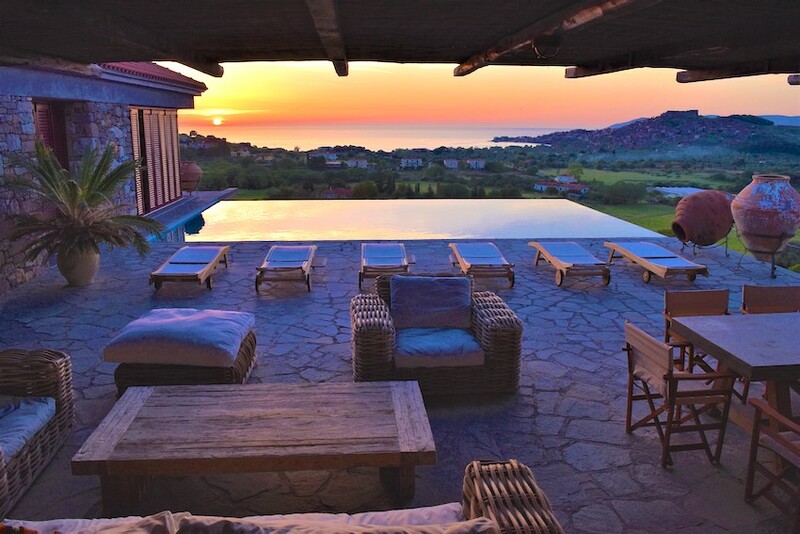 Choose your pick of the outdoor furniture from which to enjoy the pool and the views from the Villa. Watch yachts cruise the bay, fishing vessels come and go, migratory birds glide past and the traditional farming activities nearby. Soon the sun sets on the horizon, the sky erupts into colour, the village lights come on, the castle is illuminated and the stars come out to entertain. Adjoining the courtyard the gourmet kitchen is perfectly located to serve all indoor and outdoor areas. The granite servery arguably doubles as the best cocktail bar on Lesvos. Fitted with the latest appliances and sizeable prep areas, the kitchen takes advantage of local organically produced fruit and vegetables, fresh seafood and organic meats. The world’s best yogurt, extra virgin olive oils, crusty breads, the juiciest tomatoes, variety of local cheeses, local sardines said to be the world’s best, ouzo and organic wines produced locally in the traditional manner, are epicurean treats not to be missed. By day laze by the pool, listen to the distant ring of sheep bells, gaze towards Molyvos and ancient Troy beyond. Do not miss the sun set from the central courtyard. In the evening stroll to the village, enjoy a meal at one of the family run taverns and perhaps share an ouzo with one of the locals. Come enjoy this quintessential holiday environment.